I’ve been exploring how Canada’s commitments to reduce greenhouse gas emissions stack up against reality, especially in the light of the government’s recent decision to stick with the emissions targets set by the previous administration. Once upon a time, Canada was considered a world leader on climate and environmental issues. The Montreal Protocol on Substances that Deplete the Ozone Layer, signed in 1987, is widely regarded as the most successful international agreement on environmental protection ever. A year later, Canada hosted a conference on The Changing Atmosphere: Implications for Global Security, which helped put climate change on the international political agenda. This conference was one of the first to identify specific targets to avoid dangerous climate change, recommending a global reduction in greenhouse gas emissions of 20% by 2005. It didn’t happen. It took another ten years before an international agreement to cut emissions was reached: the Kyoto Protocol in 1997. Hailed as a success at the time, it became clear over the ensuing years that with non-binding targets, the agreement was pretty much a sham. Under Kyoto, Canada agreed to cut emissions to 6% below 1990 levels by the 2008-2012 period. It didn’t happen. At the Copenhagen talks in 2009, Canada proposed an even weaker goal: 17% below 2005 levels (which corresponds to 1.5% above 1990 levels) by 2020. Given that emissions have risen steadily since then, it probably won’t happen. By 2011, facing an embarrassing gap between its Kyoto targets and reality, the Harper administration formally withdrew from Kyoto – the only country ever to do so. Last year, in preparation for the Paris talks, the Harper administration submitted a new commitment: 30% below 2005 levels by 2030. At first sight it seems better than previous goals. But it includes a large slice of expected international credits and carbon sequestered in wood products, as Canada incorporates Land Use, Land Use Change and Forestry (LULUCF) into its carbon accounting. In terms of actual cuts in greenhouse gas emissions, the target represents approximately 8% above 1990 levels. The new government, elected in October 2015, trumpeted a renewed approach to climate change, arguing that Canada should be a world leader again. At the Paris talks in 2015, the Trudeau administration proudly supported both the UN’s commitment to keep global temperatures below 2°C of warming (compared to the pre-industrial average), and voiced strong support for an even tougher limit of 1.5°C. However, the government has chosen to stick with the Harper administration’s original Paris targets. It is clear that that the global commitments under the Paris agreement fall a long way short of what is needed to stay below 2°C, and Canada’s commitment has been rated as one of the weakest. Based on IPCC assessments, to limit warming below 2°C, global greenhouse gas emissions will need to be cut by about 50% by 2030, and eventually reach zero net emissions globally (which will probably mean zero use of fossil fuels, as assumptions about negative emissions seem rather implausible). As Canada has much greater wealth and access to resources than most nations, much greater per capita emissions than all but a few nations, and much greater historical responsibility for emissions than most nations, a “fair” effort would have Canada cutting emissions much faster than the global average, to allow room for poorer nations to grow their emissions, at least initially, to alleviate poverty. Carbon Action Tracker suggests 67% below 1990 emissions by 2030 is a fair target for Canada. Here’s what all of this looks like – click for bigger version. 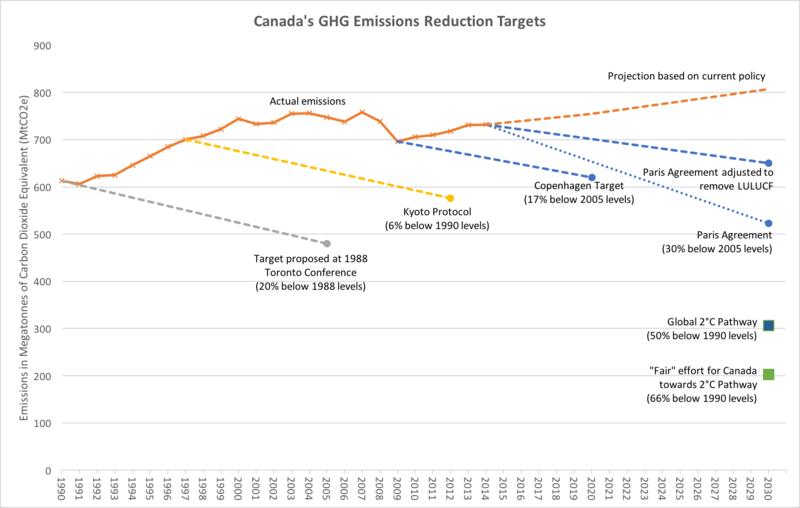 Note: emissions data from Government of Canada; the Toronto 1988 target was never formally adopted, but was Liberal party policy in the early 90’s. Global 2°C pathway 2030 target from SEI; Emissions projection, LULUCF adjustment, and “fair” 2030 target from CAT. Several things jump out at me from this chart. First, the complete failure to implement policies that would have allowed us to meet any of these targets. The dip in emissions from 2008-2010, which looked promising for a while, was due to the financial crisis and economic downturn, rather than any actual climate policy. Second, the similar slope of the line to each target, which represents the expected rate of decline from when the target was proposed to when it ought to be attained. At no point has there been any attempt to make up lost ground after each failed target. Finally, in terms of absolute greenhouse gas emissions, each target is worse than the previous ones. Shifting the baseline from 1990 to 2005 masks much of this, and shows that successive governments are more interested in optics than serious action on climate change. At no point has Canada ever adopted science-based targets capable of delivering on its commitment to keep warming below 2°C.